Use Java to develop neural network applications in this practical book. After learning the rules involved in neural network processing, you will manually process the first neural network example. This covers the internals of front and back propagation, and facilitates the understanding of the main principles of neural network processing. Artificial Neural Networks with Java also teaches you how to prepare the data to be used in neural network development and suggests various techniques of data preparation for many unconventional tasks. 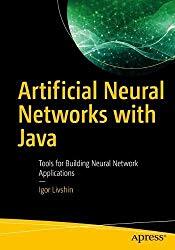 The next big topic discussed in the book is using Java for neural network processing. You will use the Encog Java framework and discover how to do rapid development with Encog, allowing you to create large-scale neural network applications.The book also discusses the inability of neural networks to approximate complex non-continuous functions, and it introduces the micro-batch method that solves this issue. The step-by-step approach includes plenty of examples, diagrams, and screen shots to help you grasp the concepts quickly and easily.What You Will LearnPrepare your data for many different tasksCarry out some unusual neural network tasksCreate neural network to process non-continuous functionsSelect and improve the development model Who This Book Is ForIntermediate machine learning and deep learning developers who are interested in switching to Java.